One aspect of artillery combat that is close to my heart is counter-battery observation. My grandfather spent the war in Russia doing this kind of job. It essentially consists of locating enemy gun positions by day and night using sound ranging, and by night using flash ranging, and to guide their own artillery to fire on it. In Africa, the Germans had Beobachtungsabteilung 11 doing this (probably under Arko 104 – more on this in the future), and a battery of 15th Panzer, Beobachtungsbatterie (Pz) 33 (326), which was under Panzerartillerieregiment 33. For the British, this work was done by 4th (Durham) Survey Regiment R.A. You can download their history here. 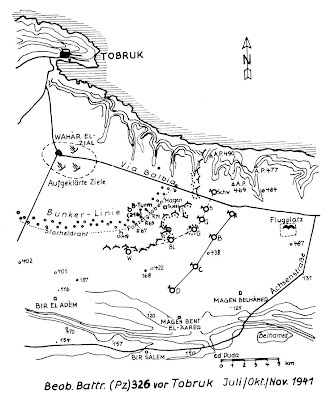 Below is a map of the observation posts of 33 (326) outside Tobruk, taken from Froben’s book “Aufklärende Artillerie”. This system observed the western edge of the siege lines. The ‘Flugplatz’ is the Gambut airfield. The ‘Achsenstrasse’ is the Axis bypass road constructed by the Italians to ensure that supply could continue to run even though Tobruk had not been taken, and the Via Balbia continued to be blocked. ‘Panzergraben’ is the tank ditch. This entry was posted in Content and tagged Artillery, counter-battery, Tobruk. Bookmark the permalink.